The FairPay Zone: Finding Good and Fair Customers -- Where Are the Sweet Spots? Finding good customers is the essential to success for all businesses. It is especially important in early uses of the new FairPay business strategy that builds cooperative "customer first" relationships. Almost everyone who hears about FairPay sees its appeal -- but they also see that, because this relationship-centered strategy seems unconventional, it may not be not suitable for all customers (at least not yet). So the question arises: "where does it work best?" Naturally, in experimenting with a new technique, the smart strategy is to begin with the low hanging fruit and low-risk learning. Here is a focused approach to finding those early sweet spots. We will give you (our customer) real power to participate in pricing -- as long as you demonstrate that you are fair about it. We will reward your generosity -- but will withdraw this special privilege if you are unfair. How hard is it to get customers to use their pricing power fairly, given the current mind-set of many modern consumers to look for bargains -- to take a very short-term view of commerce as a brutally zero-sum game of deals, not relationships? What is the nature of those low-hanging fruit customer segments? Where can we find and engage them? -- in what businesses sectors? How can we target them with niche initiatives to prove the concept and refine it at low cost and risk? How can we leverage our early learning to quickly make FairPay more simple and habitual? How can we then build on that learning with select customers to broaden the market? FairPay is an engine that motivates fairness, but it makes sense to begin using early versions of that engine where it will prove most effective -- in populations that will be eager to take to it. And even if expansion beyond those limited populations is slow, why not enjoy that ripe fruit and increase the Customer Lifetime Value (CLV) of your best customers? 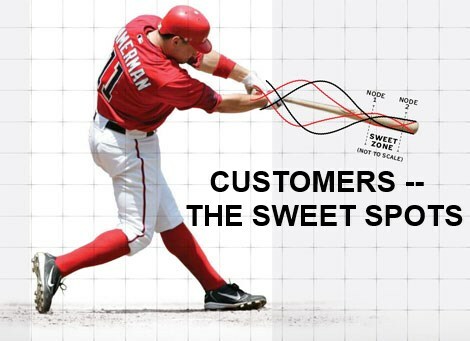 Think of these early sweet spots as the thin end of the wedge of behavior change. As customers begin to see how it improves their customer experience -- their value experience -- they will want to use it more, and others will want to join in that. FairPay is not a new behavior, but a reversion to behavioral norms that are natural, and were the way people conducted business with one another for millennia. But that is a change from current consumer mind-sets (bargain-hunting), and some customer segments will adapt to that more readily than others. Some will be slow to shift from short-term, zero-sum thinking -- viewing businesses as an enemy to exploit or be exploited by -- while others will jump at the opportunity to build a productive and cooperative relationship. The trick will be to find lines of business and customer segments who are most disposed to welcome this new logic, those for whom it is most natural. 1. Start with those disposed to generosity -- “superfans” who are loyal and perceive high value (especially appreciative customers of providers who demonstrably deserve generosity for delivering high quality, service, and social value). They are the ones who will respond best to the pricing privilege that the seller grants to the buyer in FairPay, to price in a way that considers fairness to the seller, and who will be least inclined to abuse that privilege. Managing FairPay offers for these buyers will be mostly carrot, and not much stick. They are the ones who will be most willing to pay you generously for your product or service -- as long as you establish and maintain your position as deserving, delivering on your promises, and asking in the right way for fair compensation. These are the customers who will be worth your while to start with. The FairPay process enables you to test for these attributes with low risk, nudge those who are amenable toward cooperative and profitable behaviors, and cull out those who are not (at least until there is reason to think they might be more ready to cooperate). Many posts on this blog explore various aspects of how to do that, in various business use cases. Non-profits: A Better Revenue Strategy for Non-Profits in the Digital Era. Whatever the field of business, a critical success factor will be the ongoing demonstration of customer-first behaviors that continually lead customers to see the business as responsively listening, and deserving of their trust and generosity. Retention -- win-back offers to subscribers who are asking to cancel (but had previously seen value, and could be profitable at the right price). This is covered in Winning Back Lost Customers -- Before They Get Lost. Acquisition -- offers to potential new customers in selected segments that might see value, but might be put off by paywalls or other set-price offers. FairPay can work as a kind of "fuzzy" freemium to attract these customers. Premium “member"/"patron” tiers -- offers to enhance relationships with existing customers known to recognize the value. One example is Times Premier? [/Insider?] -- What is it really worth? ...FairPay can tell. Distinct branding or white label offers. Keep in mind that these can focus on either high value/usage or low value/usage segments. An important feature of FairPay is the price discrimination that justifies lower prices to those who get lower value. For example, retention offers can focus on low usage customers who are well justified in seeking to pay less that the usual all-you-can-eat price. In such cases, those who are asked to pay more can be given to understand why it is that these others pay less, even if that fact becomes known. FairPay is well suited to a step-wise introduction that allows for testing and learning at low cost and risk. The idea is to let both the business and the customers ease into the new logic of FairPay and learn how to apply it effectively. This is addressed in the post FairPay “Free Trial”/“Survey” Mode – Easing into the FP Waters -- And Understanding Your Customers. The Trial/Survey mode it describes can generate significant learning with only simple software -- that can help shape a full FairPay implementation, as well as generate customer value perception data that is valuable in its own right -- even if the project goes no further. All of these strategies can lead to effective trials that will serve as the thin end of the wedge of behavior change. The initial strategy should be to find these sweet spots and do low-risk controlled tests there. Businesses and customers will begin to see good results and learn how to apply this kind of win-win strategy. That will generate a virtuous cycle, to increase the loyalty and CLV of the initial customers, then to attract more customers to the game, and then to lead a growing range of firms to create FairPay zones, which will then bring more customers who are ready and willing to cooperate in this more win-win mode of commerce. With this kind of focused, and carefully staged approach, the risks can be kept small and easily managed, the learning can be done over time, and the potential rewards can be immense! Direction is the foundation of the improvement of a country. Planning is essential for the course of a man. An informed individual and an useful link individual can't be indistinguishable. direction is fundamental for the new age. Direction should accord the vitality of an understudy. Everything considered, breadths of preparing have increased, which isn't awakening news for down and out individuals and supporting understudies and what's more not critical for whole world since, we need to demonstrate everyone and not http://www.professionaltypist.net/professional-typing-services/audio-typing-services/ just express people. I am fun loving to see that you are in like route focusing on such essential issues. Good post, The inclinations that we get from the planning and progression are incalculable, TV, phone, PC, control and each other favored perspective are a prompt eventual outcome of information of the general open who made the greater part of this. Here you can visit this http://www.retype.biz/how-we-convert-handwriting-to-text/ website and get numerous new thoughts.